We are offering Cable Drum Jack to our clients. Material: Frame made with heavy duty steel. Collar Type: Both end locking collar. Solid Spindle Length: 63 mm X 1.8 meter length. Designed for heavy drum lifts. Robust engineered construction with hydraulic jacks and adjustable height spindle support blocks. (Spindle/collars not included) Paint finish. Mechanical jack provided by us are as per international standards and hence soothing in operation and safety are considered in it. Matching up with the ever increasing requirements of the customers, we are engaged in providing Cable Drum Lifting Jack. 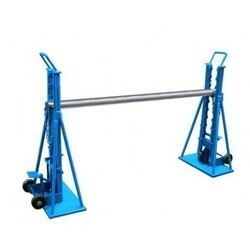 We are involved in offering a large assortment of Cable Drum Lifting Jacks. 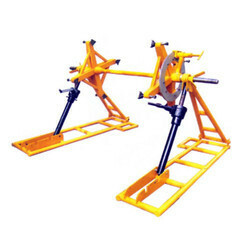 Pioneer in this industry, we are engaged in providing a high-quality range of Industrial Drum Lifting Jack. Base : 18" x 12"
Driven with excellence, we have been engrossed in delivering to our patrons’ optimum class Cable Drum Lifting Jack. The jack is available with either ratchet arrangement or plain four way head suitable for operation with ratchet or tomy bar respectively with BEARING SYSTEM. Esoofali Esmailji Karachiwala & Co.
Customers can avail this range of Mechanical Cable Drum Lifting Jack from us in the most comprehensive and industry leading prices. We have designed this range complying with the industrial standards and making usage of high grade raw material only. We manufacture the same in 5ton & 10ton.